On my first day in Bangkok, I met up with a Thai friend for lunch. No, you are not going to see him here as I did not take any photo of him. Haha! Anyway, as soon as I have checked in to my boutique serviced apartment and settled down a bit, I left the hotel to meet him somewhere in Silom. Outside, I saw these red vehicles lining the road. 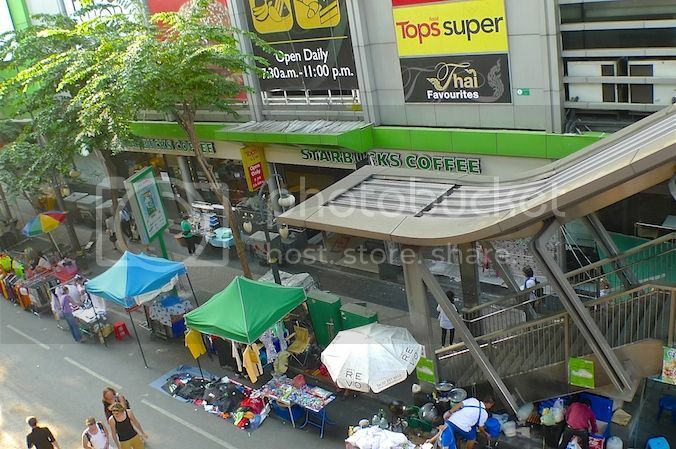 I wondered what they were as I have not seen them in Bangkok before. 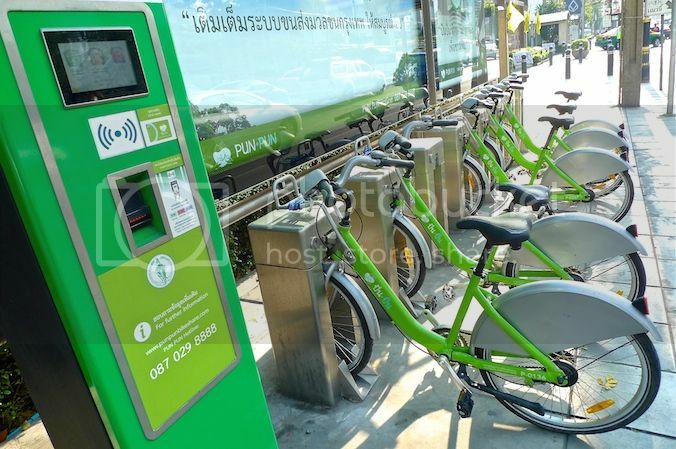 As I walked towards the nearest BTS Skytrain station which is Surasak Station, I came across these bicycles. 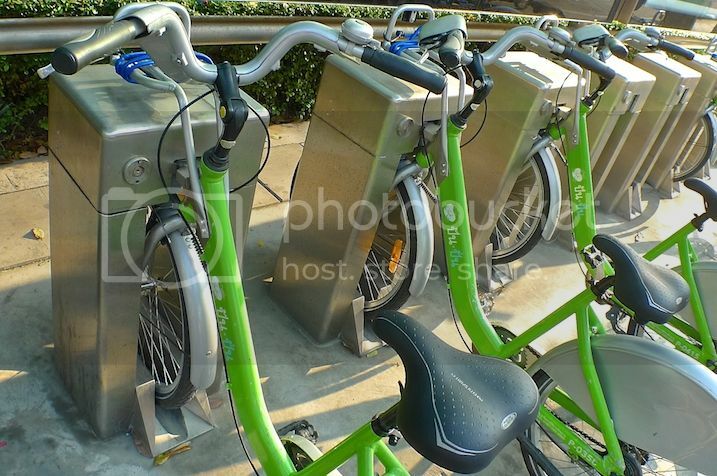 It was my first time seeing bicycles for rent in Bangkok! I found out later it is known as the Pun Pun Bicycle Sharing Scheme. How nice if Malaysia has a similar system! 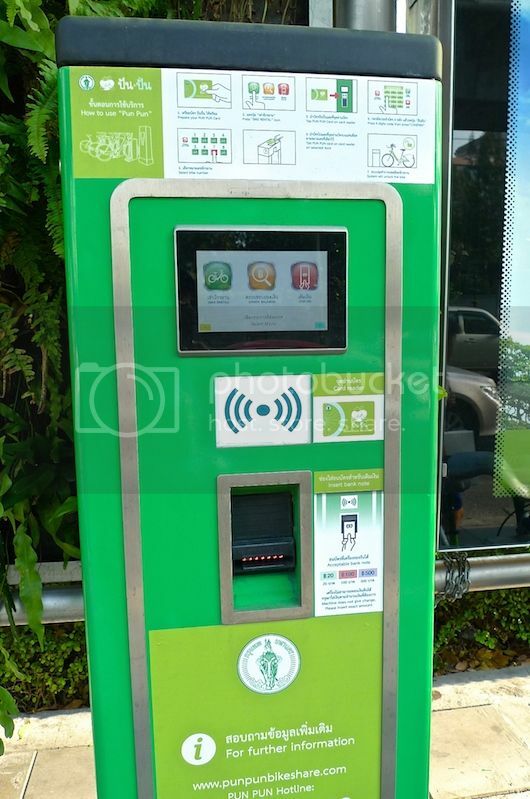 First, you need to register at the Pun Pun website (www.punpunbikeshare.com) and collect your smart card which you can then tap on this machine to key in some kind of verification code. Then you choose the bicycle that you like and tap your card on the dock to unlock the bike. It seems that if you fail to return the bike by the end of the day you will be fined a certain amount. Not sure how that works though. Maybe they could track you down using your address or something. Wonder if tourists are allowed to rent these bicycles? 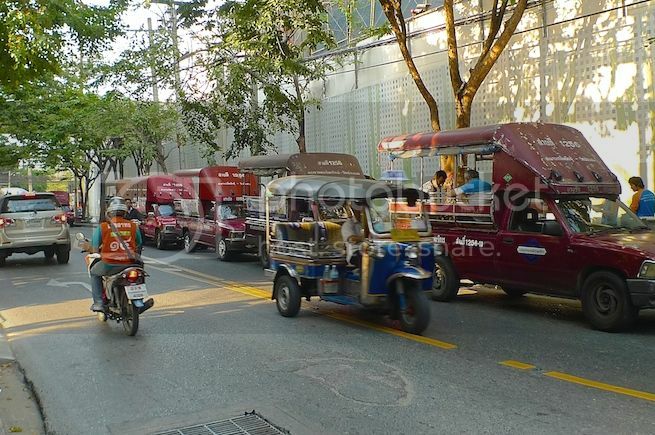 I did not try it as using the MRT, BTS, tuk-tuk and boats are more than sufficient to get me around Bangkok easily without much hassle. 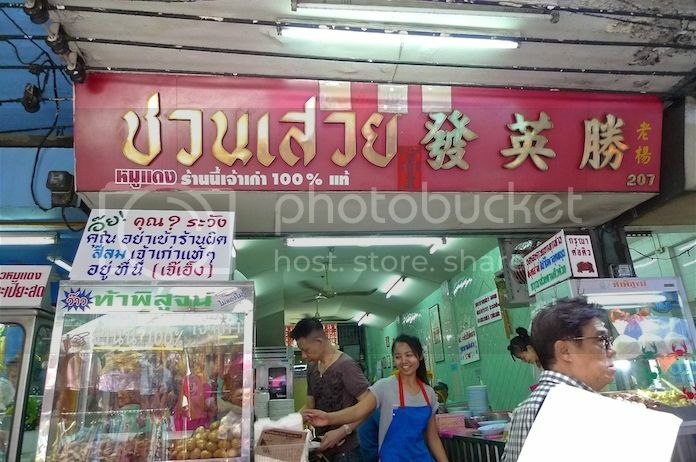 I met up with my Thai friend at a restaurant along Silom Road (not sure what's the name) to try khao moo daeng or red pork rice. 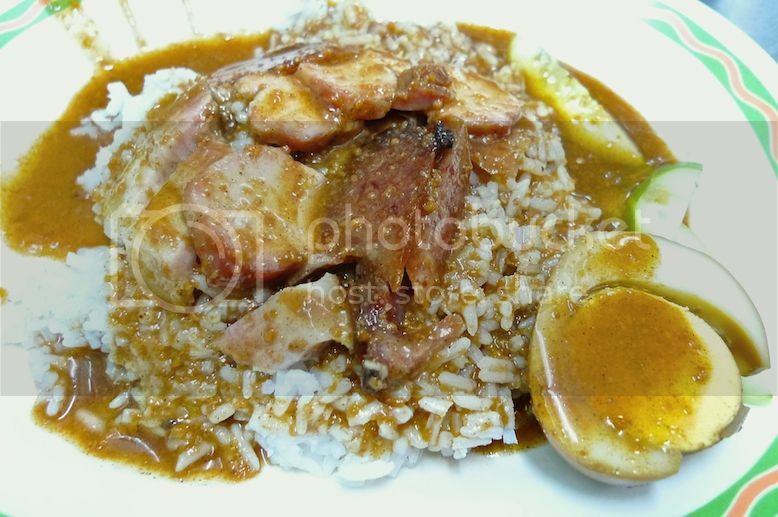 The dish is actually red barbecued pork with some sausages and egg with rice covered in a type of slightly sweet red sauce. It tasted good, but not to the extent that I must eat it again. LOL! But I don't mind having it again, of course. This is the restaurant where we ate. Notice the Chinese characters? After lunch, we walked over to Starbucks for some coffee. My brother had, before my trip, asked me to get the Starbucks card from Bangkok, as he wanted to collect Starbucks card from different countries. 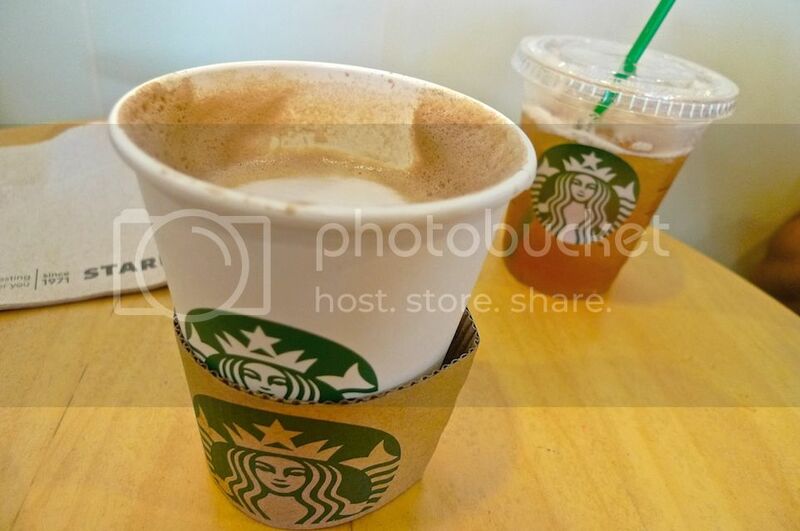 However, I (or rather my brother) was in for a disappointment as the Starbucks card in Bangkok was nothing special. I did not even bother to get the card. Anyway, I ordered coffee and my Thai friend ordered tea.